For far too long, American Indian and Alaska Native children have been one of our nation's most underserved populations. The U.S. Department of Education is committed to addressing these inequities through its new Indian Education Initiative. 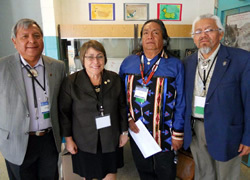 In the spring of 2010, the Department conducted consultations with American Indian and Alaska Native leaders in Anchorage, Alaska; Shawnee, Oklahoma; Pine Ridge, South Dakota; and Santa Clara, New Mexico. At each of these meetings, senior policymakers from the Department joined with regional Tribal Leaders to discuss the reauthorization of the Elementary and Secondary Education Act (ESEA), the Department's Plan of Actions for Consultation and Coordination with Indian Tribal Governments, and numerous other federal education initiatives that impact American Indian and Alaska Native students. Guiding all of the Department's conversations is A Blueprint for Reform , the March 2010 document that is guiding the reauthorization of the Elementary and Secondary Education Act, which, in President Obama's words, "is not only a plan to renovate a flawed law, but also an outline for a re-envisioned federal role in education." The Blueprint highlights much of the Administration's education agenda, making clear its firm commitment to implementing far-reaching reforms in regions across the country (including Tribal communities). However, the document is more than a policy statement; it is also a tool that will help to structure conversation and collaboration with Tribal Leaders dedicated to improving educational outcomes for American Indian and Alaska Native students. The Department's consultations have thus far engaged more than 350 leaders in the American Indian and Alaska Native education community. Tribal Leaders have all offered a great deal of thoughtful feedback on an array of issues facing their students. The Department is committed to continuing this collaborative dialogue; a team of its representatives will attend conversations in Window Rock, Arizona on June 30 and Puyallup, Washington on July 15. Transcripts from all consultations may be found in the "Important Documents" section of this Web site as they become available. Furthermore, the Department is actively working with Tribal communities to integrate suggestions from consultations into federal education policy.